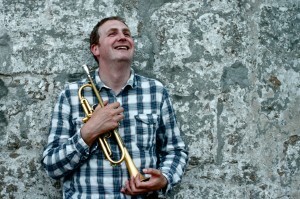 Head of Jazz at the Royal Academy of Music, Nick Smart is an internationally renowned jazz educator, trumpeter and musical director who has given guest masterclasses and performances around the world. In 2013 he was the winner of the prestigious Parliamentary Award for Jazz Education. In the UK he is recognised as one of the leading musicians on the London jazz scene, where as well as being in regular demand as a sideman to players of all generations, he continues to record and tour with his own projects. In 2005 Nick released his debut album “Remembering Nick Drake” to critical acclaim. The album featured Smart’s arrangements of Nick Drake’s music played by an all star line-up including John Parricelli, Paul Clarvis, Christine Tobin and Stan Sulzmann amongst others. It was described by Straight No Chaser magazine as “…a future classic because it really captures all that is best about British jazz….” and by John Fordham in Jazz UK as “…fascinating music devoted to a fascinating inspiration.” In December 2008 Nick released his highly praised trio album “Remembering Louis Armstrong” featuring Hans Koller and Paul Clarvis. His latest band, Nick Smart’s Trogon, merges contemporary jazz sounds with Afro Cuban concepts and is due for release on Babel Records in November 2013. His versatility as a trumpet player has allowed him to perform alongside many international jazz stars including George Russell, Bob Brookmeyer, John Hollenbeck, the New York Voices, Mike Gibbs and Dave Douglas, as well as most of the leading names on the UK jazz scene. Amongst other things Nick is currently a member of the Kenny Wheeler Big Band, in a new quartet from saxophonist Stan Sulzmann and just recorded for the new album of vocalist Christine Tobin in her interpretations of Leonard Cohen songs. As an acclaimed musical director of large ensembles, Nick conducts the Stan Sulzmann Big Band (Neon Orchestra) and the Troyka large ensemble, “Troykestra”. He also performs internationally as the regular soloist with the James Taylor Quartet.